Three games down, 13 to go with no more bye weeks. All three road teams won on Thanksgiving Thursday, which has never happened before. But this 2012 season has been full of things happening for the first time, so it fits. If it looks like I’m running out of steam for these intros, it’s because I am after usually writing 15,000-20,000 words on the NFL during the week. There’s only so much more you can say. After no comebacks or game-winning drives in Week 10, we had five this week, including three overtime games. Matt Schaub and the Houston Texans had one of the most prolific offensive performances in NFL history, and that is the Drive of the Week. Also: a bizarre comeback with six turnovers by the Atlanta Falcons, Tampa Bay’s wild comeback in Carolina, Tony Romo ties Roger Staubach in Dallas, and even the Packers do something they have never done before under Mike McCarthy: win a game after trailing after each of the first three quarters. Updating the Tony Romo saga. With a 15-23 (.395) record at fourth-quarter comeback opportunities, Romo now has the same record as Roger Staubach did. But why such the huge difference in clutch perception? Find that out, plus more, including a comparison of Romo’s comebacks to Staubach’s. A look at Thursday and Thanksgiving football in the NFL. The home team was 7-3 on Thursday this season heading into the week, but went a record-first 0-3. Detroit faced the team with the best record in football for the fourth time in the last five years. I saw CBS steal the graphic I used in the table for this article. Thanks, CBS. It was a rough four-turnover day for Luck in New England, but not all was bad as he threw for over 300 yards for the record-setting 5th time as a rookie. This week we take a detailed look at the three Thanksgiving games, Cleveland’s Super Bowl, Colin Kaepernick going from one extreme to another in terms of defense, and picks for all Week 12 games. You know about the record streaks for counting stats like consecutive games with a touchdown pass or 300-yards passing, but what about the pass efficiency streaks for roughly league-average marks like 60.0 percent completions, 7.00 yards per attempt and a 90.0 passer rating? You will be surprised to learn no one has been able to do any of those things for all 16 games in a season. Find out if anyone is on pace this season, and who has come the closest in the past. I had Houston, Dallas and New England on Thursday, so I start the week 2-1. A lot of road picks this week. Thought about sending in the backup to write this one, but I’m okay to start Week 11, which will hopefully feature more clutch wins and fourth-down attempts. After all, it is Colts/Patriots week. Find out how a game-winning punt return touchdown, rare overtime tie, and non-offensive game-winning field goal capped a bizarre week without a single fourth-quarter comeback win or game-winning drive. That has not happened since Week 13 of the 1973 season. But don’t worry, this one-shot edition covers the rarity in great detail. With four injured starters, it was a good time to take a team-by-team look at the primary backup quarterback. Let’s just say the crop is not very strong when Matt Hasselbeck, Kyle Orton and Matt Moore might be your top three options. Hasselbeck has more starts than 22 backups combined. Without Ben Roethlisberger, the Steelers can forget about winning their division, which should require at least a split with the Ravens. Find out how they can still make the playoffs with Byron Leftwich (hint: Ohio). In a game that felt like ages ago, Andrew Luck made his prime time debut and played a decent game. 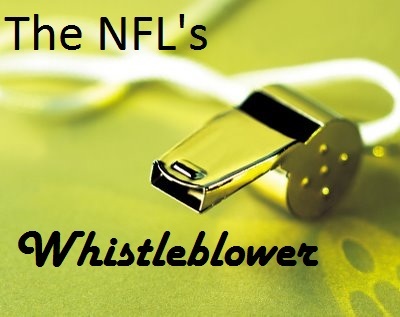 But despite all the praise from people likely seeing him play a full, live game in the NFL for the first time, find out why it was no better than his fifth best performance of the season. 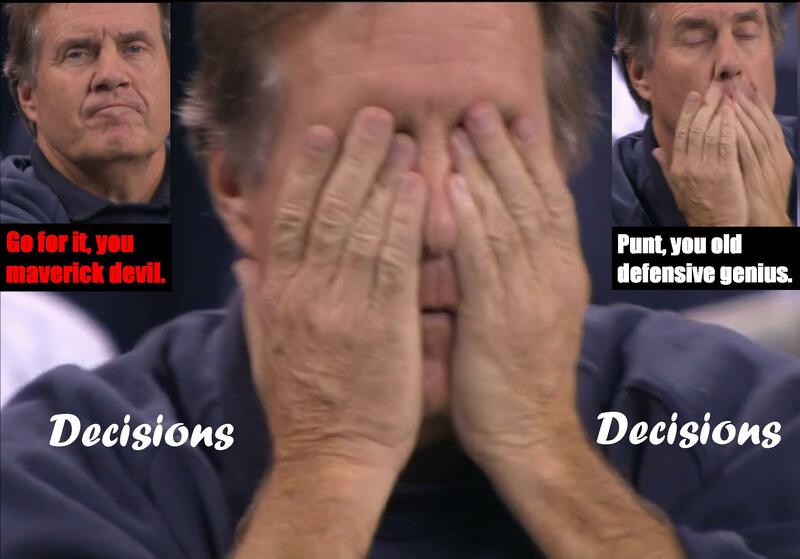 Colts vs. Patriots is always interesting. Detroit might find themselves a fourth-quarter comeback against Green Bay. It should be another record-setting day for Peyton Manning against San Diego. Byron Leftwich has not won a NFL start since October 8, 2006. 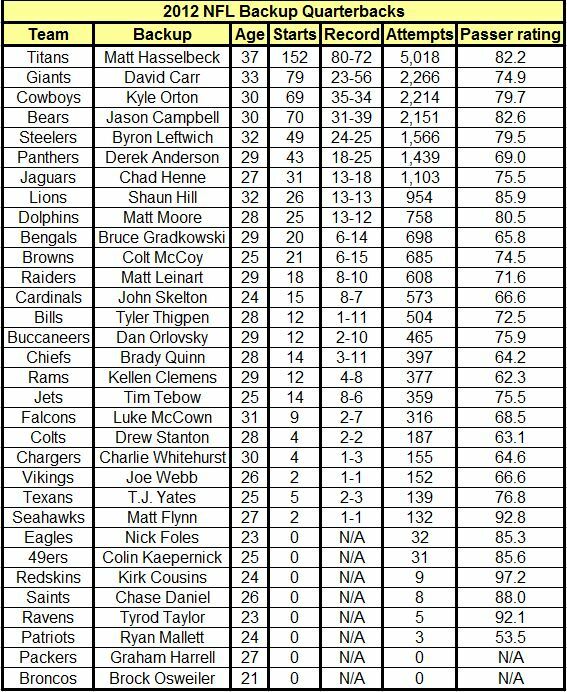 Find out some quarterbacks who went longer between NFL wins as starters, as well as picks for every game. Did you know teams are converting on fourth down 55.0 percent in 2012 (highest since 1991)? Now did you know they are going for it on fourth down the lowest percentage of time since 1991 as well? A breakdown of the recent increase in risk-adverse, gutless coaching, including a distribution of when teams go for it on fourth down, and the most common decision (4th and 1), which makes up 89.4 percent of all fourth-down attempts since 2000. A week near and dear to my heart, as we have Colts/Patriots and Ravens/Steelers. But it won’t be the same without Peyton Manning and Ben Roethlisberger involved, which also impacts the pick. In writing a NFL midseason review, it takes a lot of work to come up with something for all 32 teams. I learned that this week, passing the milestone of having written 200 articles (all but eight of them done since mid-July 2011). But even after making playoff predictions and second-half predictions for the teams, one thing I did not write anywhere were my picks for the individual awards, so here they are. The picks are based on who I think has deserved it in the first half, and not necessarily who willl win the award at the end of the season. Pittsburgh came back on the road from a 10-point deficit in the fourth quarter to win for the third time in the Ben Roethlisberger era. Andrew Luck led his fourth game-winning drive in just his eighth game. Matt Ryan (27 years, 171 days) became the youngest QB to reach 20 game-winning drives. Also included is a review of how each team’s offense has done in 4QC/GWD opportunities this season. Only Houston and San Francisco has yet to face one. This is one of three articles I did for NBC Sports this week as part of a midseason review special, and this is the central piece that looks at all 32 teams: where they have been this year, and where they are headed. Which surprises continue to amaze us halfway through the season? A look at Peyton Manning’s comeback in Denver, Andrew Luck and the Colts’ quick rebuild, the five rookie quarterbacks, the disappointment of the New Orleans Saints, and the recent dominance of Tampa Bay rookie Doug Martin. Finally, I take a look at some playoff hopefuls and just how legit their chances are, focusing on the remaining schedule and conference playoff races. Teams included: Baltimore, Pittsburgh, Indianapolis, San Diego, Miami, NY Giants, Seattle, Minnesota, Detroit, and Tampa Bay. I conclude with a prediction for the 12 playoff seeds when it’s all said and done. How good has Andrew Luck been so far? I break down his first eight games by the numbers and find all the records he’s already set or is on pace for. Hint: there are a lot of them. My traditional Luck column, breaking down his record-setting performance by Miami where he passed for 433 yards and converted 12 of 17 third-down opportunities. You voted for change? Well, not really, but change has come. Not only did I give a marquee preview of Texans/Bears, followed by Colts/Jags, Chargers/Bucs and Falcons/Saints, but I picked every game this week, and will continue to do s.
Is the second half of the season just a repeat of the first half? Not quite, but we can learn some things from it. Since 2002, 71.3 percent of teams leading their division through eight games go on to win the division. Also some interesting results on the sustainability of offense versus defense, and more playoff predictions. Dallas didn’t quite come through last week, marking the first time I picked against Atlanta this season. I am doing it again this week, but promise to only do it one more time at most going forward (regular season at least). Only five articles this week, but that just means a bonanza next week when we officially hit the midpoint of the NFL’s regular season. Stat of the week: Eli Manning has produced just as many 4QC/GWD (3) in new Cowboys Stadium as Tony Romo. 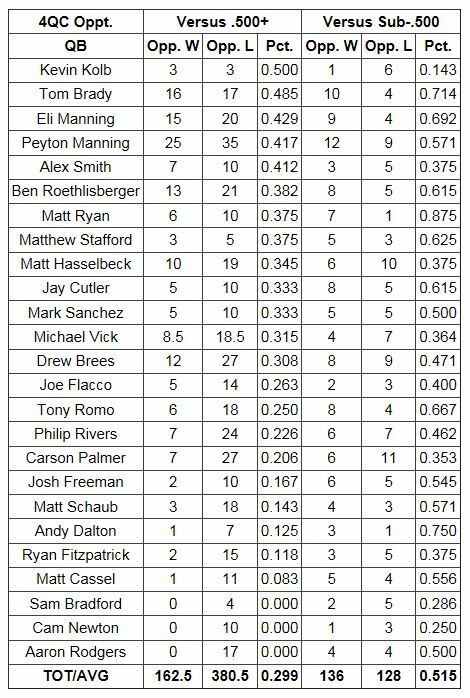 Only problem is Manning’s played there four times compared to 23 starts for Romo. Also: Cam Newton bounces around from Superman to Scam in Chicago, Matthew Stafford comes up big again, and Andrew Luck gets to 3 game-winning drives in just seven games. We also find that Betty White scores more in Cleveland than Philip Rivers. Just how many passes did the Redskins drop in Pittsburgh on Sunday? Depends on which site you look at. I went through every incompletion and offered a look at each. Robert Griffin III’s stats were definitely impacted, but most of the plays weren’t as harmful to Washington’s cause as you might have expected. Oh we have a logo now, and Andrew Luck has his second comeback and third GWD already with his best game of the season. Despite being pressured so frequently, Luck was very efficient and was at his best late in the game: 10/12 for 115 yards, TD and both incompletions were dropped. The Colts had a different gameplan this week, and I have the data to back it up. This week we look at the 37 teams to start 7-0 since 1940. Tony Romo is the only QB in NFL history to defeat two undefeated teams who were 7-0 or better (9-0 Colts in 2006, 13-0 Saints in 2009). When Eli Manning and Ben Roethlisberger meet on Sunday, it will only be the 9th time a pair of quarterbacks with multiple Super Bowl rings face each other (as active owners of 2+ rings). It is the 7th time the Steelers are involved in such a game, and the third year in a row for Roethlisberger. We also have a potential first meeting of rookies with winning records this late into the season with Andrew Luck and Ryan Tannehill. Finally, some perspective on how great Drew Brees has been in the Superdome in prime time, and how the Eagles and Michael Vick will try and save their season with a road win. 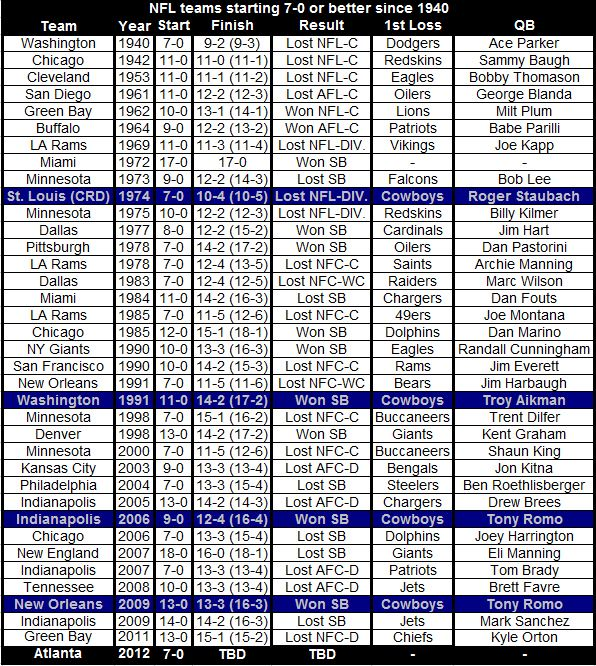 I compiled over 800 fourth-quarter comeback opportunities for 25 active starting quarterbacks and broke them down for strength of schedule (SOS), looking at strength of victory, and the records against teams .500 or better and teams with a losing record. Some individual notes on all 25 quarterbacks included. Definitely some interesting results. Originally I picked Atlanta to go 8-0, but doesn’t it seem like the stars are aligning for a Dallas upset? The Falcons are hardly dominant, even though they are hard to beat in that dome. The Cowboys have upset two undefeated teams in recent years, have a good matchup here, and let’s not forget Tony Romo is Mr. November with a 19-2 record in the month. After all the criticism this week for the loss to the Giants, this is actually the perfect opportunity for the Cowboys to show up and deliver a big win. Or, they will fall flat on their faces as the Falcons’ undefeated march continues. But I think I’m going to roll the dice and go with the upset.